FRAME: Aluminum and steel structure epoxy coated. Anthracite grey. Side post section 80x110 mm. Easily interchangeable strong aluminum ribs, section 18x30 mm, with patented plastic crowns that increase the resistance and life, simplify the maintenance and improve the design. Ribs are properly fixed to the crown one by one. 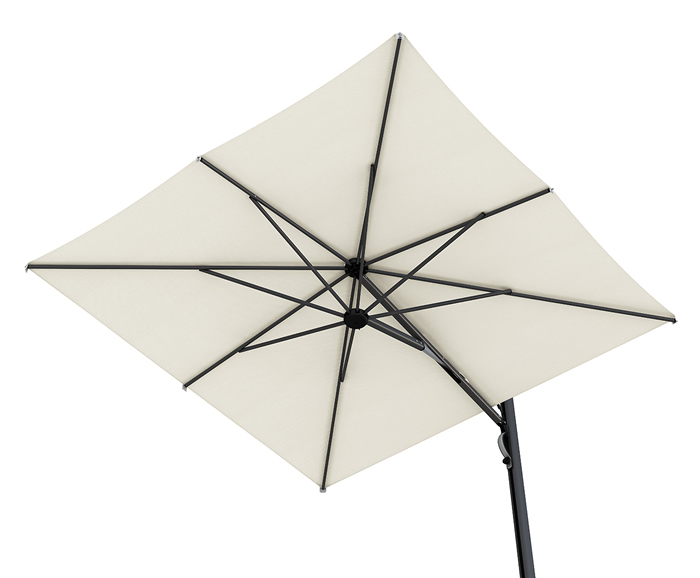 With opening system close on the support that allows an easy closing of the parasol without moving the furniture (unlike all cantilever parasols). Accessories in stainless steel. Easy opening and closing WITH INNOVATIVE GAS SPRING. 360° rotating metallic base is included.